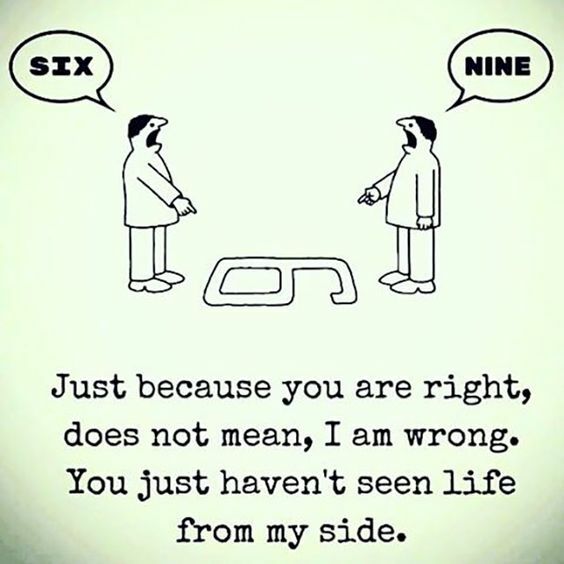 "Just because you are right, Does not mean I am wrong"
Standing on the opposite side of a 6 for example one person sees it as a six (6) the other sees it as a nine (9). You may have heard the saying: " you get a 6 for a 9"
So one person argues that it is a six the other that it is a nine. That is how life is! We see things from different perspectives and it doesn't mean that either is wrong. We have to be open minded enough to think things through and accept the fact that your exposure, your upbringing, your learning path, your culture, and your country, societal influences, all are contributing factors to the way you see things. Because you are a thinking person with creative abilities the outcome could differ even though you can understand things from the other persons perspective. This simply means that you do not set out to change a person, but instead seek first to understand. The difference between can and cannot is only 3 words. 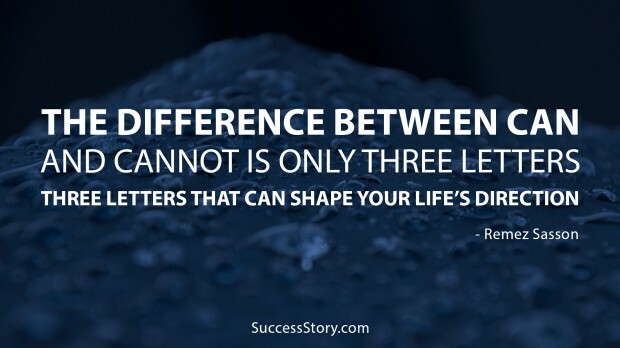 That difference can shape your life. Which word would you choose? It is funny how you are reminded of things from your younger days when you come across quotes like this. The word can't could not be used when asked why by a parent. The question if the word can't (cannot) was used was... why not! It was easier then to go figure it out than to try to answer what clearly would have been an unacceptable comment. That's how we began to deal with challenges...there was always a way and we had to find it. 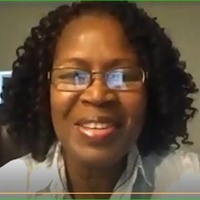 Wallace D Wattles in his book The Science of Getting Rich says: "The good things you already have have come to you along the line of obedience to certain laws. Gratitude will lead your mind out along the ways by which things come; and it will keep you in close harmony with creative thought and prevent you from falling into competitive thought." "Gratitude alone can keep you looking toward the All, and prevent you from falling into the error of thinking of the supply as limited; and to do that would be fatal to your hopes."